Casino Action has been bringing the glitz and glamour of a Vegas-style casino into your home for more than a decade. If you are still not part of this online community, where have you been? Casino Action has been paying out players since 2000 and there is no sign of stopping. 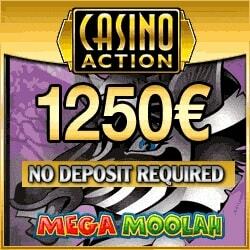 As a welcome surprise, Casino Action is offering all new players €/$1250 free play bonus. As the name suggests, it is totally for free which means you don't have to involve your deposit. Simply put, the casino pay and you play to win as much as you can. You can also cash in on this fantastic offer, plus registering an account is fast and easy. There are plenty of other rewards up for grabs at Casino Action, including regular promotions and the very popular Deal-a-Day, which is a guaranteed bonus every day that you log in to play at the casino. And play you will, because there are more than 700 games to choose from including video poker, slots, blackjack, roulette, craps and scratch cards. Play all the latest video slots, which include some popular choices like the Bridesmaids™ Online Slot, Hot as Hades, Titans of the Sun, Rabbit in the Hat, River of Riches and Avalon II. Table players will be thrilled to know that they can choose from more than 40 games, with single- and multi-hand versions of blackjack available and US, French and European roulette. Then there’s a variety of other fun games like scratch cards, Keno and even an arcade-style game called Max Damage and the Alien Attack. Depositing and withdrawing is very easy and secure, as Casino Action uses 128-bit SSL encryption to ensure that your details are always safe. Plus there are a range of payment options to choose from including Visa, MasterCard, Neteller, POLi, eCheck and Ukash. Casino Action has received the eCOGRA seal of approval in recognition of games that are fair, payouts that are prompt, excellent player service and responsible casino conduct. eCOGRA is an independent organization that is devoted to ensuring the integrity and security of online gambling. Casino Action is also licensed by the Malta Gaming Authority (MGA), a highly sought-after license. With all these credentials, game choices and banking options, you would expect Casino Action to have a superb support team. And they do not disappoint in this department either. Contactable via a number of mediums (including phone, email and live chat), the support team at Casino Action is available 24 hours a day, 7 days a week to assist with everything you need to know. It’s time to let Vegas into your home and onto your PC, tablet or smartphone – it’s all your entertainment needs in one awesome place. ← Captain Cooks Casino 100 free spins & €525 bonus – Big Jackpots!